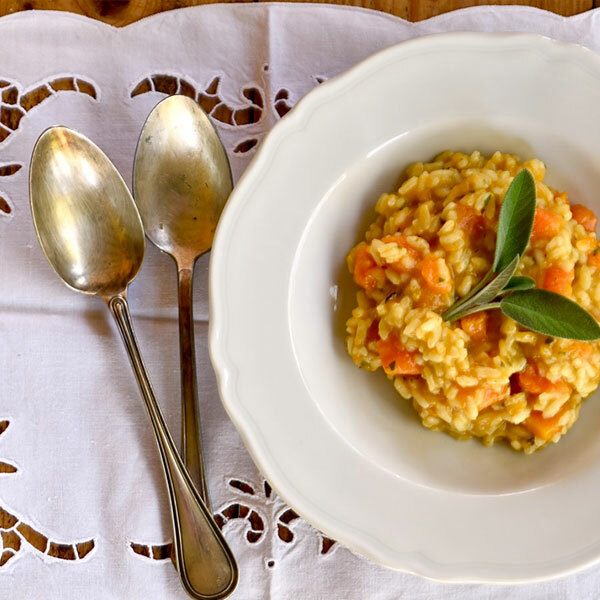 The soft and sweet squash combined with the crunchy and creamy texture of the rice is just the perfect combination far this fall recipe. The sage is essential to give a little hint of bitter and herby flavor. Healthy and delicious! In a medium-to-large cast iron cooking pot (I use a STAUB) sauté sage and onion in extra-virgin olive oil stirring occasionally. When onion is soften, add the minced garlic and cook 1 to 2 minutes. Add the rice and cook until translucent, stirring to prevent rice sticking to the bottom of the pot. Add squash, mix and sauté for about 5 minutes. Pour the wine in and stir until evaporated. Add enough boiling stock so that everything is covered and simmer over low heat, stirring occasionally. Add more broth as needed, a ladleful at a time. When rice is half medium cooked the add coarse sea salt and check by taste. When rice is cooked, about after 15 minutes, turn the heat off, add the butter and parmigiano cheese and Mix vigorously. Leave the risotto cover with the lid to rest for a few mins. Season with some black pepper and serve immediately.